Hyperbaric oxygen therapy (HBOT) is a treatment method that uses highly pressurized oxygen to speed up healing of certain injuries, infections and disease conditions. This treatment has been FDA-approved for use in patients with several conditions, including carbon monoxide poisoning and severe burns, but has also proven effective in off-label treatments in numerous systems of the body. Hyperbaric oxygen treatments are used for a wide variety of purposes, frequently with great success. Although HBOT is commonly used to treat wounds, infections and other temporary conditions, it can also help improve chronic neurological, vascular and ophthalmic conditions. Decompression sickness, commonly known as "the bends"
Hyperbaric oxygen therapy may also be used to treat patients with skin grafts or serious burns. Many patients with neurological conditions lack sufficient oxygen and blood flow to the brain. During HBOT, oxygen is forced into the brain and once-dormant areas can be reawakened. For this reason, although not yet officially FDA-approved for neurological conditions, HBOT has proved helpful in improving gross and fine motor skills, vision, hearing and speech function after traumatic brain injury. It is difficult to refute such claims since nearly any type of disorder can benefit from increased oxygen levels. During HBOT treatment sessions, patients are placed in a chamber with increased atmospheric pressure that allows them to breathe in oxygen under three times more pressure than the oxygen in normal air. As the increased oxygen levels saturate the tissues of the body, the body's natural healing process is stimulated, enabling new blood vessels to grow, inflammation to decrease, toxins to be deactivated and infections to be resisted. HBOT sessions take place either in a chamber set up to accommodate one patient (monoplace) or a chamber that can comfortably hold up to twelve (multiplace). Patients remain in the hyperbaric chamber for between 1 and 2 hours. For some few patients, a single session is all that is required, but in the majority of cases, patients receive multiple treatments, often daily sessions for up to a month. 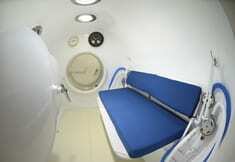 If a patient occupies a monoplace hyperbaric chamber, the situation is somewhat claustrophobic. If the patient is in a chamber that accommodates many patients, however, it is possible for the patients to walk around, albeit in a circumscribed space. In order for patients to see effective results from HBOT, treatment sessions may be required every day for up to 6 weeks. Although HBOT has proven to be a very safe treatment, there are certain risks involved with any type of medical treatment. The most dangerous aspect of HBOT is the risk of fire or explosion from the concentrated oxygen in use during treatment. For this reason, many precautions are in place to make sure the patients and medical personnel are safe at all times. While nearly all patients will experience the relatively minor discomfort of pressure in the ears as is common during airplane travel, for most HBOT is not an unpleasant experience.